Trump's Budget is Terrible for Our Water and Health. Again. Clean Water Action Founder David Zwick passed away in February 2018. In 1969, he was a law student at Harvard. He took an assignment from Ralph Nader to lead a team to investigate the state of our nation’s water. When he started he thought he would find that water pollution “was a problem that a few little lifestyle changes could solve.” What he discovered was something else entirely. David and his task force of researchers found that industries were allowed to pollute with impunity, dumping cancer causing waste like lead, arsenic, and mercury directly into our water. He found water systems that weren’t able to properly treat the water to make it safe to drink. He found that our water and our health were at risk. After two years David reported on the study in a book he co-wrote with Marcy Benstock. Water Wasteland was front-page news and became the starting gun for Congressional efforts to pass the Clean Water Act. David knew that Congress wouldn’t pass the Clean Water Act just because they thought it was a good idea. He recognized that, sometimes, representatives and senators had to be dragged kicking and screaming to do the right thing. He couldn’t drag Congress on his own. So he built a movement. David believed in people. He believed in organizing. He understood that the only advantage we have over special interest money is strength in numbers. David, along with a few others, founded Clean Water Action in 1972 (then called the Fishermen’s Clean Water Action Project) with a grant from a fishing tackle manufacturer. He and his team continued to work the halls of Congress in support of new pollution laws. They started educating the public and found new ways to engage and activate people, to grow and strengthen the movement for clean water. And it worked. 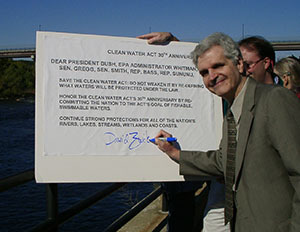 Congress passed the Clean Water Act in 1972. Several parts of the Act, including the landmark Citizen Suit provision which allows Americans to sue polluters who are putting our water at risk, were written by David. One of the most important lessons David and his team learned during the campaign to pass the Clean Water Act was that powerful industries have amazing access to lawmakers thanks to deep pockets and the only way to counter that is through education and organizing. David and the team kept working, building power and expertise. In 1976 Clean Water Action opened its first canvass, pioneering a new way to engage Americans, educate them, and get them to advocate for their families and their communities. To this day one-on-one canvassing is the centerpiece of Clean Water Action’s theory of change and the reason we keep on winning for our water. Understanding that to make lasting change, you also have to elect lawmakers who will join in the fight to protect clean water and public health, David and the Clean Water team turned to electoral politics. They took the lessons learned from the campaigns to pass and defend laws like the Clean Water Act and began electing leaders who would put the public interest first. This pioneering model of campaigning is now recognized as the best way to win and has led to the election of clean water leaders like President Obama, Senators Paul Wellstone and Elizabeth Warren, and countless state and local elected officials. David’s influence on our water is hard to overstate — our water is cleaner and safer today because of David. But his impact on our democracy is equally important. He and his team changed how we interact with our government, and the way we get involved in the most important issues of our time. It’s a legacy to shout about from the rooftops and a fight to keep waging. Trump’s budget is terrible for our water. Again. For the second year in a row, the Trump Administration has proposed a federal budget that would be a disaster for our water. As Congress debates how to fund the government beyond the March 23 deadline, it must prioritize the health of our communities, clean water, and the climate. The Administration’s proposed budget for 2018 largely follows the same playbook that they trotted out last year: slash funding for the environment, eliminate popular and effective programs that keep our water clean, and ignore the health and safety threats posed by the changing climate and corporate pollution. Despite last year’s proposal going nowhere in Congress, the Administration has once again proposed eliminating or reducing several important programs and grants at Environmental Protection Agency. Administrator Scott Pruitt says he cares about stopping pollution, but he has once again signed off on eliminating funding for commonsense core activities at EPA and for vital state programs such as monitoring and cleaning up beaches, stopping non-point source pollution like runoff from farms, and voluntary water efficiency. A number of other programs at EPA would see reduced funding, including the Underground Injection Control program, which protects drinking water sources from oil and gas injection wells; public water system grants; surface water and wetlands protection; and oil spill cleanups, among many others. The proposal also eliminates regional programs that clean up and protect major waterbodies like the Chesapeake Bay, the Great Lakes, the Gulf of Mexico, San Francisco Bay and others. The Administration claims to care about water, but this budget pays minimal lip service to the goal of improving water infrastructure. While it would continue grant and loan programs that help communities with drinking and wastewater infrastructure, the wholesale gutting of EPA, undermining enforcement of pollution prevention laws, and rolling back of protections completely contradict any benefits of investing in water infrastructure. Simply put, the Trump budget would make our water more polluted, and that is unacceptable. Congress must reject this dangerous proposal and refuse to cut funding for the programs and protections we need to survive. If you want to make change, you have to get involved. It’s an ethos that infuses Clean Water Action’s work. 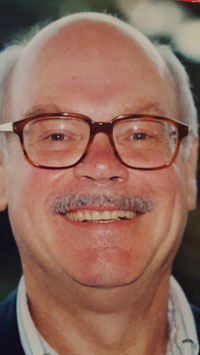 That is how one of the organization’s founding board members, Peter Lockwood, lived. Peter passed away in fall 2017, after a long illness. Clean Water Action lost a member of its family and the public lost a steadfast defender of public health and our communities. Peter was a tax lawyer and a champion for clean water. He was Justice Thurgood Marshall’s first law clerk. He was part of the civil rights movement throughout the 60s, and carried on a commitment to that fight his entire life. He helped found Clean Water Action in 1972 and was a guiding light for the organization for more than 40 years. He will be missed, sorely. Peter was compassionate, thoughtful, and witty. He was a legend at Clean Water Action board meetings. He could move from the deep details of a financial report to an impassioned defense of the right of Americans to push back against abuses of power that helped perpetuate pollution and harm to the public — and Clean Water’s duty to join the fight — in the blink of an eye. He understood, deeply, our mission and knew what was at stake. Peter knew how to ask the right questions to help focus the attention of our work to protect clean water — both for the big picture, but also the wonky and thorny legislative and regulatory details that we have to wade through. Peter’s connection to Clean Water Action and commitment to the organization and the campaigns we worked on seemed bottomless. Even as other board members and staff came and went, Peter stayed on, determined to help Clean Water Action achieve success, weather storms, and make progress on the most pressing issues of the past 45 years. Peter was proud of Clean Water Action’s work and we are humbled by his support over the years. We are eager to carry his passion and commitment forward as we work to defend the landmark and commonsense protections that Peter helped us win. Our thoughts are with Peter’s friends and family. While Scott Pruitt’s management of EPA — and his attempts to roll back protections for water and health — have been a keen focus for Clean Water Action during the Trump Administration, his counterpart at the Department of the Interior, Secretary Ryan Zinke, deserves some attention too. It has been almost a year since Zinke inexplicably rode a horse to his first day of work as Secretary of the Interior — and it was a great year for the oil and gas , but a bad year for public lands, clean air protections, and government accountability. The department oversees around five hundred million acres of federal land, and more than one and a half billion acres offshore, but rather than acting as a steward of these resources Zinke has acted time and time again to sell off public lands and coasts to the oil, gas, and mining industries. After a “review” early in his tenure, Zinke recommended — and President Trump subsequently acted — to shrink several national monuments, including drastic reductions in protected public land for the Bear’s Ears and Grand Escalante monuments in Utah. Zinke also acted to expedite oil and gas drilling permits on federal land. More recently, Zinke released a plan to open up all of America’s coasts to offshore drilling. Following public backlash, Zinke exempted Florida — but no other state — from the plan. Florida Governor Rick Scott is an ally of President Trump, and Trump’s vaunted “Winter White House,” Mar-a-Lago sits on the the Florida coast. Zinke is also gutting a bipartisan plan to save the endangered sage grouse, because he would rather open up millions of acres to mining than follow through on the bird’s preservation. In reaction to Zinke’s policies on public lands, and his unwillingness to meet with them, nine of twelve members of the National Park System Advisory Board resigned last month in protest. In a move that jeopardizes public health and the climate, Zinke has been undermining, delaying, and repealing protections against dangerous methane emissions from oil and gas operations. And, as another handout to the fossil fuel industry, Zinke scrapped a rule that ensured coal companies don’t shortchange taxpayers when they sell coal on the foreign market. National Monument is opposed by a coalition of tribes who are working to preserve important cultural and historic sites within the monument’s original boundaries. He has also reneged on the department’s Land Buy-Back Program for Tribal Nations, and halted plans to turn control of the National Bison Range over to the Confederated Salish and Kootenai tribes. Ryan Zinke’s legacy won’t solely be his disdain for the public good and his efforts to cater to corporate polluters — it will also be a legacy of scandals, ethics violations, and shady behavior. Along with many other members of the Trump Cabinet, Ryan Zinke has taken costly private flights at public expense, including flights that blur the lines between public business, private tourism, and campaign activity. 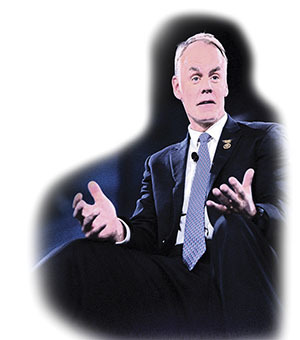 One flight, on an oil executive’s private plane, enabled Zinke to visit the Las Vegas Golden Knights hockey team, which is owned by a billionaire who maxed out on campaign contributions twice during Zinke’s Congressional campaigns. Other trips paid for by the department helped Zinke appear at Republican Party fundraiser in the Virgin Islands and a fundraiser at a Montana ski resort. Zinke is under multiple investigations for these trips. In the midst of Republican efforts to repeal the Affordable Care Act, Zinke notoriously called Alaska Senator Lisa Murkowski — a holdout on healthcare — and noted that Donald Trump was unhappy with her position. Since Interior oversees 55 percent of Alaska’s land, this was widely seen as a veiled threat to Murkowski’s agenda and resulted in another investigation by Interior’s Inspector General. Yet another investigation into Ryan Zinke is looking at whether he violated campaign finance rules when his dormant congressional campaign committee sold a used motor home at a steep discount to a Republican candidate in Montana. After a full year of using his position to increase corporate profits, take costly private trips, sell off our public lands and coasts, and jeopardize public health, it’s understandable that Ryan Zinke’s only defense is to question the loyalty of his critics. Unchecked agricultural pollution continues to be a leading cause of tainted water quality throughout the United States. 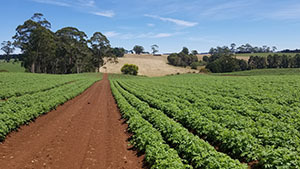 Pollution from agricultural producers is difficult to manage because much of it is non-point — meaning that diffuse pollution sources like fertilizers run off of fields and end up in nearby streams and rivers. In particular, nutrients like phosphorous and nitrogen in fertilizers can have a detrimental impact on water resources downstream. Excessive nutrients can result in harmful algal outbreaks (also called blooms), some of which contain toxic bacteria that can make humans and pets sick when they swim or come into contact with algal contaminated lakes, rivers, or bays. Toxic algal outbreaks can also contaminate drinking water supplies, resulting in higher treatment costs for utilities in charge of delivering safe drinking water to their customers. Congress is currently debating the 2018 Farm Bill, which offers Clean Water Action and allies opportunities to advocate for strengthening and increasing funding for conservation programs that offer incentives for farmers and producers to voluntarily reduce nutrient runoff from their fields. Many of these conservation programs have multiple benefits: they provide habitat for wildlife, reduce soil erosion, and restore topsoil, while also protecting water quality in streams and rivers. It is critical for farmers who want to be good stewards of their land to have access to these conservation programs. In addition to increasing the funding for conservation programs in the Farm Bill, it is vital that these programs be monitored and reported on so they can be evaluated to ensure they are in fact contributing to improved water quality conditions downstream. Congress could vote on a final Farm Bill package as early as the end of March 2018. Clean Water Action and many conservation and environmental allies have already endorsed two pieces of bipartisan legislation to strengthen the Farm Bill. The first, the Healthy Fields and Farm Economies Act of 2018 (H.R. 4751), would provide necessary tools and funding to measure and evaluate the environmental outcomes of farm conservation programs to ensure that taxpayer dollars are being used effectively and efficiently. The second bill, the American Prairies Conservation Act (S. 1913/H.R. 3939) would reduce misguided taxpayer-funded incentives to convert critical grasslands to croplands. Prairie grasslands provide vital ecosystem services, including providing wildlife habitat, flood mitigation, erosion control, and water filtration, and should be protected from being plowed over. Clean Water Action and several other conservation groups represented by the Southern Environmental Law Center, filed a lawsuit in early February to challenge the Trump administration’s unlawful suspension of the 2015 Clean Water Rule. Environmental Protection Agency (EPA) administrator Scott Pruitt has led a multi-year campaign to eliminate the Clean Water Rule, beginning when he was Attorney General of Oklahoma. Now Pruitt is helping deliver on a Trump campaign promise to big polluters, like industrial agriculture and fossil fuel producers, to allow them to pollute and destroy small streams and wetlands. The 2015 Clean Water Rule clarified that Clean Water Act pollution prevention programs must include protecting small streams and wetlands because these resources impact the water quality of downstream rivers, including those used for drinking water. The 2015 rule was developed through years of extensive public outreach and scientific analysis; the Obama administration reviewed over a million public comments submitted during this process, the majority of which urged for the protection of small streams and wetlands. Unfortunately the EPA under Scott Pruitt has just suspended the commonsense 2015 rule and intends to propose a much weaker policy later this year to permanently strip pollution protections for these vital water resources. Clean Water Action and conservation allies believe EPA violated federal law by not providing the public adequate opportunity to comment on its decision to suspend the Clean Water Rule. 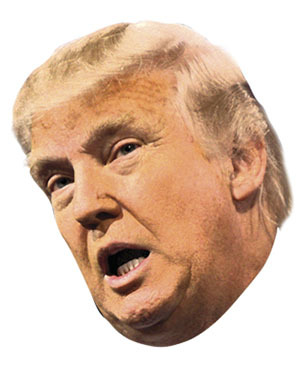 The Trump administration has also failed to offer any compelling scientific evidence or economic analysis to indicate that eliminating Clean Water Act protections for streams and wetlands is in the public interest. A change in administration did not change the laws of gravity or of common sense — water flows downhill and is all connected — a small stream that is polluted will carry that pollution to rivers that people depend on for drinking, swimming, and fishing. The Trump administration continues to put polluters over people. They refused to take public comment on the protections provided by the Clean Water Rule and continue to ignore the loud opposition to weakening clean water safeguards. Federal law gives the American public the right to be involved in changes to environmental regulations, yet the EPA under Administrator Pruitt continues to show contempt for public engagement. Clean Water Action will continue to fight any and every attempt by the Trump administration to gut Clean Water Act protections and are confident that this latest scheme to suspend protections will be rejected by the courts. The first year of the Trump Administration has been an all-out assault on our health, water and climate. The administration is currently working to roll back dozens of protections. While Trump’s allegiance lies with his corporate polluter friends in the oil and gas and coal industries, we need to stand up and fight back. There are currently two opportunities to resist Trump’s reckless agenda. Save the Clean Power Plan! The Clean Power Plan is the most significant action the US has ever taken to address climate change. But Trump and EPA’s Scott Pruitt want to eliminate it. By reducing pollution from power plants, the Clean Power Plan would provide real, tangible benefits for our health. The plan could prevent 90,000 asthma attacks, 300,000 missed work and school days, and 3,600 premature deaths annually by 2030. As the single largest source of greenhouse gas pollution in the US, power plants must be cleaned up to avoid the most devastating impacts of climate change. Take action here to help save the Clean Power Plan! ▶ Tell DOI: No offshore drilling! Protect our oceans, coasts and climate! The Department of the Interior announced plans to allow oil and gas drilling in nearly all US coastal waters, putting more than 100 million offshore acres under imminent threat from Big Oil. Offshore drilling leads to costly oil spills that pollute our beaches, kill wildlife and harm our coastal and marine economies. Offshore drilling risks the livelihoods of our communities that rely on tourism, fishing, recreation and boating. This is one more way the administration is selling us out to their biggest donors, putting oil and gas profits over people and the environment. The Department of Interior is taking public comment on this reckless plan. They need to hear from you. Take action here today!